A strong contingent of both commercial buyers and stud masters turned out for the 25th Annual Highlands Droughtmaster Sale in Clermont last Friday, with 69 buyers registering with the agents. Fifty-three out of the 66 bulls sold through the ring for an average of $5839, up $1786 on 2015. 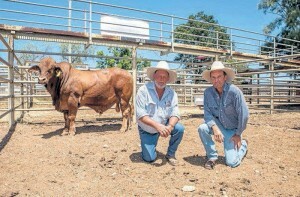 Four bulls sold post sale to bring the final clearance to 86pc. Topping the sale at $16,000 was the Ruthford family’s Redskin Gadget (P), a 27-month-old son of Bryvonlea Lockyer, which sold to a joint partnership between Duncan and Karen Geddes, CMC Droughtmasters, Springsure and John Atkinson, Glenavon Droughtmasters, Yaamba. Redskin Droughtmasters averaged $9500 over seven bulls with four selling into five figures, including the $12,000 top priced herd bull, purchased by repeat buyer Jeff Mills, Melrose, Morinish; 27-month-old Redskin Goldrush going to Juanita Pastoral for $11,500 and the 28-month-old Redskin Grinner, which went to Craiglea Droughtmasters for $10,000. Shane and Wendy Perry, Strathfield Droughtmasters, Clermont averaged $6250 over their draft of six, including the $9000 Strathfield Hati, which went to Reklaw Cattle Company. Same and Jane Barton, Huntly Droughtmasters, Clermont also had an impressive sale, selling nine herd bulls to average $6444 and topping at $8000 with a 29-month-old selling to Perry Pastoral Company. First-time vendors, Wayne and Ingrid York, Karrangarra Droughtmasters, Emerald sold Karragarra Lookalike (P) to Jeff and Maria Hyden for $8000, and a $7000 herd bull to Wilga Pastoral Company. Aleisha Finger, Amalfi Droughtmasters, Dingo also topped at $8000 at her first Highlands Sale with a herd bull selling to Reklaw Cattle Company. Bulls topped at $16,000 for Redskin Gadget (P) pictured with Ken Rutherford, Redskin Droughtmasters and Duncan Geddes, CMC Droughtmasters. Topping at $8000 again was Greg and Donna Edwards, Wolfang Droughtmasters, Wowan with Wolfang Tally-Ho (P) sselling to Mt Wilga Pastoral Company, while the Donaldson family, Medway Droughtmasters, Boguntungan hit $7000 twice, with the 27-month-old Medway Vineyard selling to Appleton Pastoral Company and a hefd bull going to Kurajong Pastoral Company. Andrew and Sonya Harvey, Kenlogan Droughtmasters, Clermont also topped at $7000 with Kenlogan Radler going to Jeff and Mara Hyden. The sale drew to a close with a small but quality offering of heifers on account of Errol Appleton, Toronellah Droughtmasters, Nebo. All four heifers sold to average $5125 and top at $9500 for a 19-month-old polled Durack Viking daughter, which was purchased by Chris and Hailey Heness, Ridgie Didge Droughtmasters, Goomeri. Jackie Sharkey, Kirala Droughtmasters, Sarina purchased two heifers to average $3250 each, while La Shae Droughtmasters took home the remaining heifer for $4500.